I do not fully understand the reason for the success of some social networking sites; nor the way that some people share the most private details online with others. There is even an app called "I Just Made Love" that allows those so inclined to report their most recent encounters. I use Facebook as a means of keeping in touch with students and colleagues at work, as well as a few outside friends; and Twitter has proved its value as a swift means of communicating news and ideas, if you are prepared to do some filtering. I usually, therefore, avoid apps that seek to add another format (or site) to the limited social networking I do now, but a look at the free app glmps which shares photographic output in an unusual way, at least piqued my interest enough for a download. 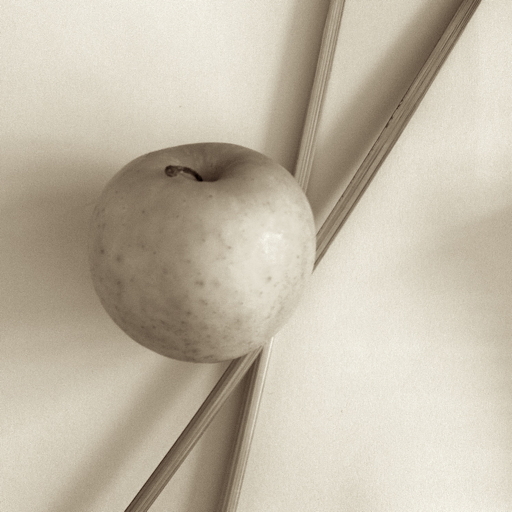 The concept involved concerns the way the iPhone camera works. It receives input from the moment it is active, but only records what it is instructed to save. This app, capitalises on the working aspect and as soon as the user begins the process of taking a photograph, the video becomes active. It is not hard to imagine the giggly setup moments for a serious, posed group shot, or children playing before a still picture is taken, as well as a number of other scenarios in which such a mix of still and video could be attractive. When such a combo-image is captured, the still becomes a thumbnail in a corner of the video, while tapping that thumbnail makes the video a thumbnail in the corner of the photograph. With those I accessed on the iPhone from other users, this change was not possible. However it was on the glmps site and on my Facebook Wall. Initial steps take the form of allowing Location Services and Push notifications then logging in (Facebook or Twitter) or an account on another social networking site: Tumblr, Blogger, Foodspotting, Posterous and Mixi are mentioned in the iTunes app information. There are also a couple of screens displayed as part of the initial setup information that show briefly, yet clearly, the capabilities of the app. The final step is pressing a button marked, Get Started. This opens a screen with three options, Popular, Friends and Capture. 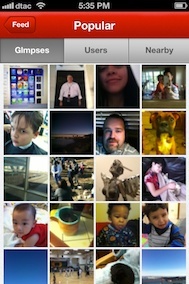 The Popular panel links to "Glimpses" of what others are doing; Users; and Nearby. Pressing each of these loads Previews. When I tried initially there seemed to be a feed problem, although both the iPhone, the iPad and the Mac were clearly online. These feeds all came back later. When I looked at the Friends section (Following, Followers, Search) no one I know was using this. This left me Capture. A health warning here: the moment that button is pressed and the camera opens, video is being recorded. It may take a few seconds (more or less) to set up a shot, but in that time, several seconds of video might be on the iPhone. While in some cases this is exactly the effect one wants -- to bring out the special moments connected to taking of a photograph -- some scenes might need censoring in rare circumstances. 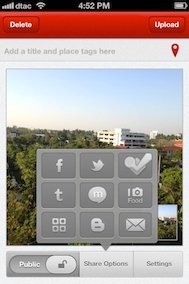 Tapping on Share Options opens a tidy panel with nine choices. I selected Mail and this may cause the image and video to be uploaded to the glmps server. Like some of the other connections this failed initially. As all connections with other apps and other devices appear to be correct, there may have been some problem with outside sources. The camera screen in glmps is square. All images I transferred to the Mac were 610 x 610, (0.4MP) and economical at 92KB. The app is not intended for high level work. Normal images on the iPhone 4S are 3264 x 2448 (8MP) and 1.96MB. The first emails I sent to myself had URLs but on the site pages the video opened as blank. However both still image and video were saved in the iPhone Photo Library as separate files. An hour or so after I started trying out this app, with no changes to the wifi where I am staying, all the links began to work properly and I was able to upload a test image to the glmps server. I also noted that the earlier (failed) tests had long URLs in the emails, while the successful upload had a shortened URL. This is an unusual app that combines the three media or photograph, video and social networking site that may be useful to some users. The additional input changes the nature of the message. I must admit warming to glmps as I took some test shots: imagining the ways this might be used in a number of contexts. While the app is well designed and nicely put together, outside factors, especially the intermittent network connections to the site.